Roasted Spicy Brussel Sprouts and Tomatoes is a tasty and delicious vegetable side dish that goes well with almost any meat entrée. The best part is that they are prepared in one pan, so clean up is simple. This recipe was inspired by two things–an over abundance of brussel sprouts and the need for a side dish that would go well with a Mexican inspired dinner entrée. 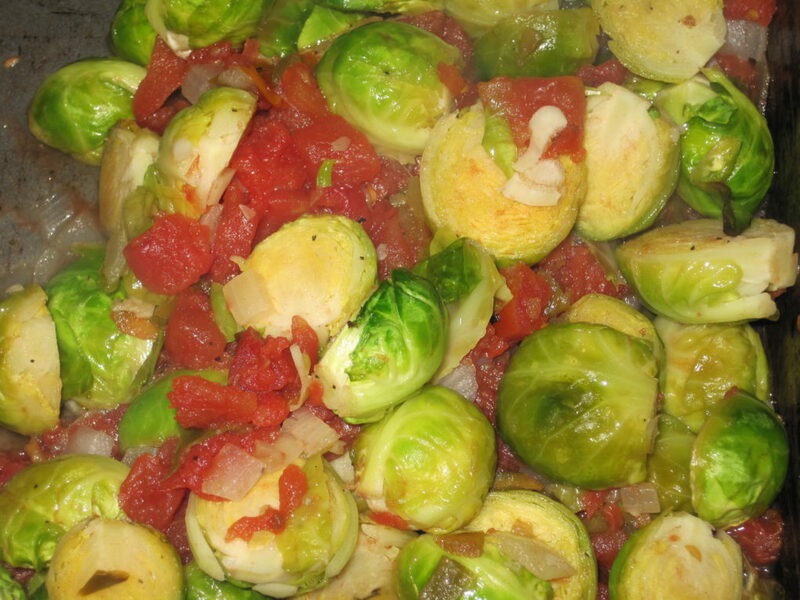 The solution was to cook the brussel sprouts with a spicy tomato blend and onions. This all began when I became the recipient of a 25 pound box of fresh brussel sprouts. I blanched and prepared some of them for the freezer, gave a bunch of them away, and still needed to cook more than five pounds. This may explain why I have recently published several brussel sprout recipes. This version, in which the brussel sprouts are roasted with onions and spicy tomatoes, was the perfect accompaniment to our dinner of southwestern seasoned chicken. 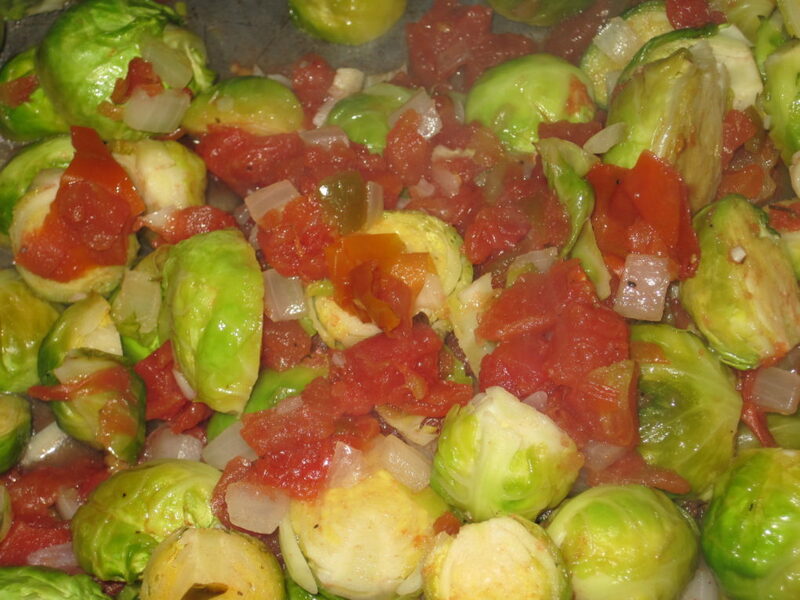 Give our recipe for Spicy Brussel Sprouts and Tomatoes a try and let us know what you think by leaving a comment below. Looking for a new way to serve brussel sprouts? Give this recipe a try. It's simple and delicious, and goes great with chicken, pork, or pretty much whatever you are having. Cook's Note: We used a can of mild tomatoes and green chilies in this recipe, but if you like things hotter, you can use the medium, or hot, versions instead. 1 (10 ounce) can mild tomatoes and green chilies. 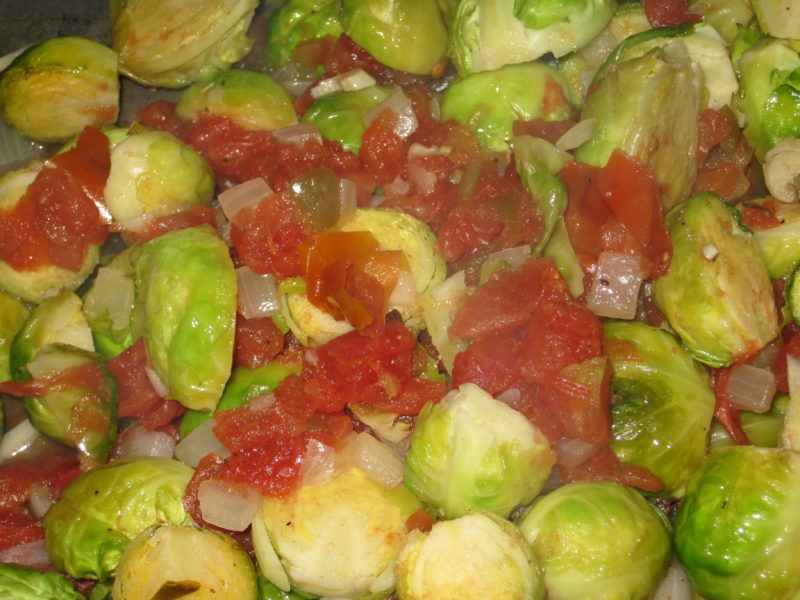 Place brussel sprouts and onion into a 9X13 inch pan. Toss vegetables with olive oil. Bake for 20-30 minutes, until brussel sprouts are tender. Hi And thanks for another simple and tasty recipe for any season or entree. Although 9 months away, I will remember this one for a new red and green Christmas side dish. That’s a great idea. I hadn’t thought of using it as a Christmas dish, but you’re right. It’s perfect.